Do you want to watch Adam Lambert in Manila for free? 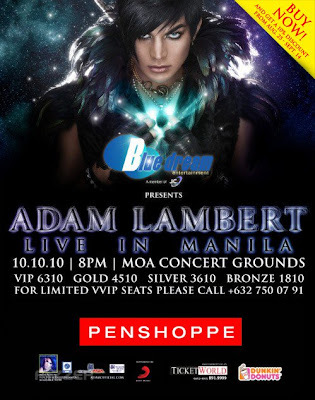 Then you might just be in lock because Penshoppe is giving away 2 VIP concert tickets to the Glam Nation Tour: Adam Lambert Live in Manila to 1 lucky FACEBOOK FAN! Tag Penshoppe (OFFICIAL) by using the "@" sign. Make sure the tags turn blue. You can post as many entries you want, but you must tag different people in each status message. Your status message should be posted on your wall and has to appear on the Penshoppe (OFFICIAL) Fan Page wall to count. Entries will be based on posts that appear on the Penshoppe (OFFICIAL) Fan Page wall. Deadline for entries in 11:59 p.m. of Sunday, October 3, 2010. Winner will be chosen using random.org on Monday, October 4. Redemption of tickets will be from October 5-8, 2010.